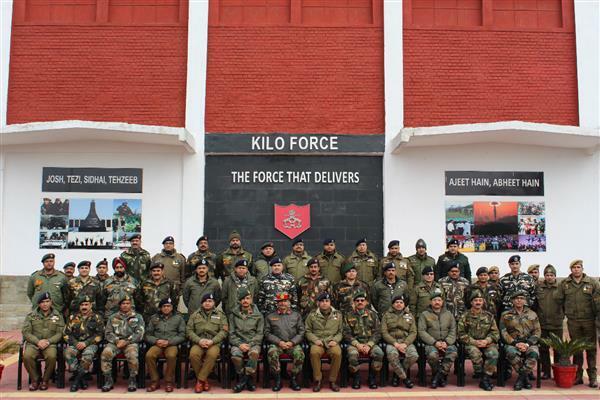 Srinagar, Jan 20 (KNS): A holistic review of the security situation in North Kashmir was carried out by Lt Gen A K Bhatt GOC 15 Corps at Sharifabad Garrison on 20 January 2019, which was attended by GOC Kilo Force, IGP, Kashmir and senior officials of the security forces from the Army, J&K Police and the CRPF. Lauding the seamless and enhanced levels of inter-agency synergy, the Corps Commander highlighted that the peace and stability achieved in North Kashmir in 2018 was a result of the professional conduct and synchronised efforts of all the security forces. Restricting local recruitment for terrorism, positive engagement of the youth, incident free conduct of Urban Local Bodies and Panchayat elections and ensuring minimum civilian casualties as also limited collateral damages during operations were deemed as the biggest achievements for the Security Forces in 2018. The improved security environment has brought in a glimmer of hope for the Awaam in North Kashmir in the new year. The Corps Commander also used the occasion to felicitate several Police and CRPF officials on being awarded the coveted Chief of Army Staff and Army Commander, Northern Command Commendations for their unparalleled courage and dedication to duty during the year gone by.